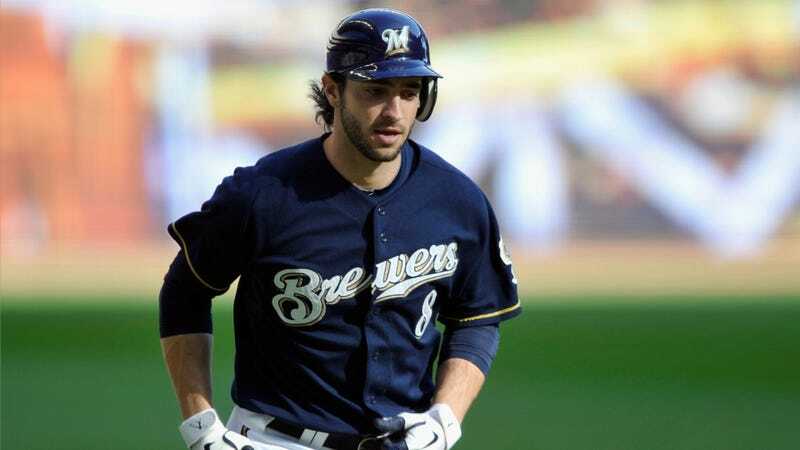 We told you on Saturday night about Milwaukee Brewers left fielder Ryan Braun, the reigning National League MVP, and his failed drug test. Then a whole bunch of stuff got written on Sunday and turned a fairly straightforward PED leak into a baffling mess. (Jay Jaffe at Baseball Prospectus has the best run-down of all the coverage.) The various reports don't jibe with one another or with MLB's banned substances list. ESPN doesn't explicitly name the substance. ESPN tells us only about a testosterone spike that, in subsequent testing, was determined to be synthetic. From that, it's probably safe to intuit that the substance in question is testosterone (which is banned by baseball). Now here's the New York Daily News, reporting that Braun's testosterone levels in his initial test were "insanely high." Milwaukee Brewers star Ryan Braun's original test for performance-enhancing drugs as the playoffs were winding down in October was "insanely high, the highest ever for anyone who has ever taken a test, twice the level of the highest test ever taken." According to the source, there are also chain-of-custody issues involving the test, which was first performed by Major League Baseball during the playoffs, then sent to the WADA lab. A positive test in MLB is triggered by an elevated level of testosterone to epitestosterone; the trigger point is a 4-1 ratio. "The argument before the appeals board won't be that the original ratio was so high and doesn't make sense," said the source, "but there will be a defense. It's not something he knew or should have known about." A very good source on the Ryan Braun side of the drug testing controversy assures me that Braun did not test positive for a performance-enhancing drug, as reported by ESPN's "Outside the Lines." But my source—and again, this is from Braun's end and not MLB—familiar with the test's findings says the "prohibited substance" was not a performance-enhancing drug or steroid of any kind. And the source says there has "never" been a result like this in the history of the MLB testing program. Did you follow any of that? ESPN says Braun tested positive for a performance-enhancing drug, but Braun denies that. Braun's people do not deny that he had "insanely high" testosterone levels—his team seems to offer that willingly—nor do they deny that he tested positive for a substance banned by baseball. The Daily News story introduces some new claim about "chain-of-custody" irregularities, but goes on to explain that Braun won't be disputing the insanely high results, only his responsibility for them. So the testing process is challenged, and then it isn't. What did Braun actually take? Baseball's banned-substance list is split into three categories: performance-enhancing drugs (58 substances in all, among them masking agents that aren't, strictly speaking, performance enhancing), stimulants (30), and drugs of abuse (seven). If we believe Braun's team, which acknowledges that he took a banned substance but denies that it's a PED, that could whittle down the list of possibilities to the latter two categories. We consulted a physician who prescribes many of these drugs regularly who told us that Braun would have no routine medical reason to take any of these. There's a slim chance Braun suffers from testicular failure, male breast cancer, or prostate cancer, and never mentioned it to MLB. But probably not. More likely, Braun would be taking these drugs for their masking benefits, if indeed one of them was the banned substance for which he tested positive. All of this is to say that we don't know how Braun's people will argue his innocence, mostly because the messages have been so mixed so far. (If we believe the New York Times, "Ryan doesn't know what caused the positive result," which complicates the Daily News's claim that Braun's people won't dispute the elevated-testosterone finding.) What's clear now is that this case is a hash of medicine and semantics, where no one has enough details, and we're a long way from knowing exactly what Braun took.